How dangerous are domestic cats? You are here: Home / Uncategorized / How dangerous are domestic cats? A pet cat with a “history of violence” attacked a baby before trapping a family and dog in a room. How much of a threat are house-trained felines to the human population? Lux, a 10kg (22lbs) black-and-white Himalayan, scratched a seven-month-old baby in the face, according to police in Portland, Oregon, USA. When the child’s father Lee Palmer struck the four-year-old animal on the rear in retaliation, it began charging at the family, forcing them to take refuge in their bedroom. “He’s very, very, very, very hostile,” Palmer told an operator in a panicked 911 call, during which Lux could be heard screeching in the background. Palmer added that his pet had a “history of violence”. It’s birds and small rodents which have most to fear from cats’ hunting instincts. Some breeds are more aggressive than others. Bengal cats – a cross-breed of domestic cats and Asian leopard cats – have a reputation for attacking cats in neighbouring houses, says Bradshaw. By contrast, he says, Persians and Siamese cats have typically forgotten how to be good hunters. Usually a cat will scratch or bite a human who is being too persistent in stroking it. The cat will lash out because it thinks it is being held down. 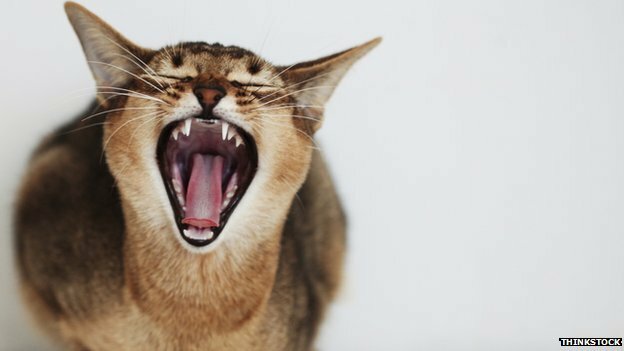 Instead, Bradshaw suggests paying attention to a cat’s body language is usually the best way to avoid ending up on the wrong side of its claws.